The U.S. state of Utah is home to several national parks which Zion National Park is the first to be established. Similar to its neighbors, Bryce Canyon, and Arches, Zion is well­known for the beautiful red and white sandstone rocks that encompass it. The park is 229 square miles and houses 75 different mammals, 289 different species of birds, and numerous reptiles. The park provides visitors with a glimpse at four different life zones including coniferous, riparian, desert and woodland. Though Zion Canyon is the most prominent feature of the park, Zion also includes mesas, slot canyons, arches, rivers, and buttes. With its various different features, the park offers an endless array of activities. Ranging from backpacking and hiking to canyoneering, bird watching, rock climbing and horseback riding, the park provides visitors of all ages and interests a chance to explore. Visitors can also drive through the national park via the Zion­Mount Carmel Highway. The park also includes the Kolob Plateau to the north, which gives visitors a different view of the park. With one of the largest free­standing arches in the world, Kolob Arch and Kolob Canyons are another great way to see the beauty of the park. Zion National Park is also a great place to learn about the history of Mormon pioneers that settled the area. There are several ranger­led activities and the park has different museums where teachers can bring their classes to learn. With millions of visitors a year, the park has become a big attraction to people all over the world. Zion National Park lodging in Springdale gives visitors not only a close stay to the park, but also provides several different places to dine and explore even within the town. Zion Lodge is operated by Xanterra Parks and Resorts. The Zion Lodge is the only lodging facility located inside beautiful Zion National Park. Zion Lodge's ideal in-park location puts you close to all of the park's features and attractions. The lodge itself is quite unique with its historic design featuring knotty pine woodwork and furnished in a beautiful log and wicker furnishings. Flanigan's Inn is a year-round boutique Inn that is conveniently located five minutes from the south entrance of Zion National Park. Surrounded by the cliffs of Zion Canyon, the eco-resort features a restaurant, outdoor pool, hot tub, and a full-service spa and salon. is made The lodging options are made up of standard rooms, patio/deck rooms, and suites. The newly renovated Driftwood Lodge is a boutique hotel just 2 miles from the south entrance of Zion Park in Springdale, Utah. Room accommodations vary and include balconies and patios, views of the surrounding area including the red cliff mountains of Zion and the Virgin River. Guests can enjoy fantastic on-site amenities such as the restaurant, outdoor pool, shuttle pick-up and barbecue picnic areas with river access. The Majestic View Lodge is located in Springdale, Utah and is less than three miles from the south entrance to Zion National Park. The lodge offers an on-site restaurant, trading post, gift shop, and well-appointed rooms featuring either a king or two queen beds with a private balcony or patio to take in the views of the surrounding mountains and nature. Holiday Inn Express Springdale rests peacefully at the foot of some of Zion National Parks most beautiful red-rock cliffs. You will love the views and the hospitality that you will find at this great lodge. The Cliff Rose Lodge Gardens offers 40 comfortable rooms and suites less than a half-mile from the main entrance into Zion National Park. Novel House is nestled at the base of Zion's towering sandstone cliffs. This beautiful bed breakfast is within walking distance to the main entrance of Zion National Park. Zion Ponderosa Ranch Resort provides beautiful and comfortable lodging on a private 4,000-acre working ranch is prime for recreation as well as solitude. Zion Ponderosa Ranch Resort shares a border with Zion National Park. Many activities are right at the resort such as horseshoes, tennis, ping pong, Fooseball, pool table, basketball, frisbee golf, volleyball, croquet, softball, soccer and the awesome two-tiered pool with slide and hot tub. Zion National Park is just 20 minutes away, but it is not necessary to leave the ranch at all. The Parry Lodge, founded in 1931, is located in the heart of Kanab, Utah. 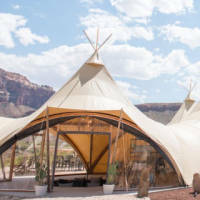 The lodge is within 90 minutes of three national parks (Zion, Bryce Canyon, and Grand Canyon) and numerous other recreational areas in Red Rock Country. The Parry Lodge has hosted many Hollywood legends as they filmed movies around Kanab. Guests can experience that movie history today as they stay either in a single unit or in a family suite and enjoy the Old Barn Theater on site, a heated pool, and on-site classic dining room. Q. Where is Zion National Park? A. Zion National Park is located in southwestern Utah, in between the larger cities of St. George and Cedar City. The closest town to the park is Springdale, Utah. Q. What is the history of Zion National Park? A. Zion became established as a national park in the year 1919. Before that, it existed as Mukuntuweap National Monument, which was established in 1909. It's name, Zion, literally means “place of refuge,” and was given to the canyon by early Mormon settlers. Q. What is the weather like in Zion National Park? A. Zion is a fairly mild park with a yearly average temperature of 75 degrees. The seasons present large variations in temperature however, with about 52 degrees in January to about 100 degrees in July. It's desert climate makes for a great year-round park, just make sure you are careful when driving there during the winter! Q. What is the best time of year to visit Zion National Park? A. Typically people venture to Zion National Park starting in the spring to view the incredible display of wildflowers. Summer and fall remain popular times to visit, while the winter season sees far less visitation but still offers beautiful scenery. Q. How much does it cost to visit Zion National Park?